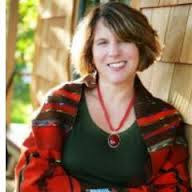 I'd like to welcome author Holly Robinson to Book Club Exchange. 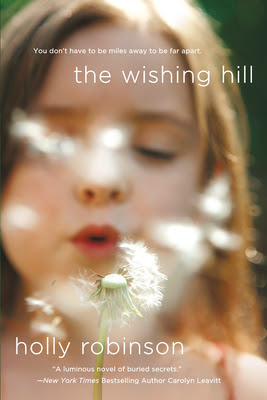 I just finished reading her latest novel THE WISHING HILL, and I will soon share my review. This book tells the story of a woman named Juliet who is facing a lot of change in her life. It is perfect for book clubs! When I asked Ms. Robinson to write something for Book Club Exchange, I was thrilled to receive this guest post. It's such an interesting viewpoint and one I never really considered as "the reader!" The first time I ever visited a book club, I had just published my memoir, The Gerbil Farmer's Daughter. As I was walking up the front walk to the house—a house so hard to find that I'd gotten lost twice—the other book club members were arriving with plates of food and bottles of wine. I knew she meant “younger” but was too polite to say so; professional photographers have a habit of taking just enough pounds and wrinkles off your picture to make your image more media-friendly. But the truth was that I did feel much smaller, because I was terrified. I had never been to a book club before, never mind to a meeting where people would be discussing my own writing! Now, as I prepare to launch my new novel, The Wishing Hill, I'm eagerly awaiting my first book club meetings. I have become a huge fan of putting authors and book clubs together, because these meetings allow readers a glimpse inside the writing process and definitely help authors write better books. It wasn't until I attended my first few book club meetings, for instance, that I realized readers don't necessarily care about the same things I do as a writer. Though many keen readers appreciate the craft of creating lovely imagery or fine sentences, those readers won't get past the first chapter if you don't also give them a plot with tension in the narrative and sympathetic characters—or at least interesting nasty characters. Readers are busy people with many other commitments shredding their time, and our books have to compete with other wonderfully absorbing forms of entertainment. If you don't deliver the story, your book will be put down forever and forgotten. On the other hand, book clubs also teach authors that there are as many reasons to read a book as there are to write one. One reader might adore a certain character or setting, while another can't stand the sight of that name on the page and hate the setting because it's too gloomy, too mountainous, or just plain unbelievable. Hearing book clubs discuss your characters as if they're real people living right down the street makes me realize, as a writer, how essential it is to make the people in my books as complex as the people in my life. Listening to book clubs discuss our work can also make writers sit up and take notice of themes in our own writing that we didn't even know were there. I leave every book club gathering not only with a belly full of great snacks, but with a head full of ideas for my next book. Sometimes I don't even make it out of the driveway before having to whip out the journal in my purse and furiously start writing. So, dear readers and writers, meet at book clubs and talk amongst yourselves. We have a lot to teach each other. Holly Robinson is an award-winning journalist whose work appears regularly in national venues such as Better Homes and Garden, Family Circle, Huffington Post, Ladies' Home Journal, More, Open Salon, and Parents. Her first book, THE GERBIL FARMER'S DAUGHTER: A MEMOIR, was a Target Breakout Book. She holds a BA in biology from Clark University and an MFA in creative writing from the University of Massachusetts, Amherst. A huge thanks to Ms. Robinson for participating in Book Club Exchange! Oh my, I can only imagine how scary it is. Yikes.